It’s beginning to look a bit like Christmas in Webster City as merchants and organizations finish final plans for the big Christmas in the City event on Sunday afternoon. The day begins with a free children’s movie at the Webster Theater beginning at 11 a.m. The movie is sponsored by Osweiler’s Fashions. Local retailers will roll out the red carpet from 1 to 5 p.m., inviting shoppers into the stores to see Christmas displays. Stores will have specials throughout the afternoon, as well, according to information from the Chamber of Commerce. Feed those hunger pangs while shopping with a hot dog and chips, provided by Hy-Vee, along with cookies and hot chocolate, courtesy of Fareway. 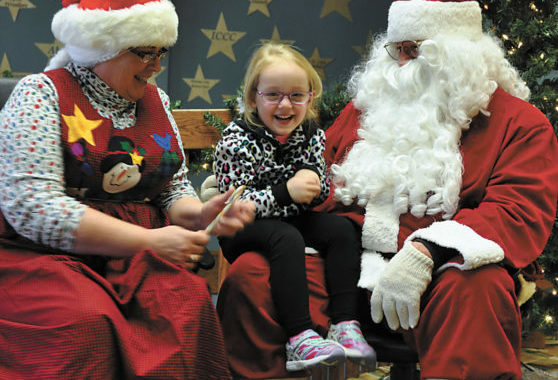 Children will have an opportunity to share their Christmas wish lists with Santa Claus and Mrs. Claus from 1 to 5 p.m. The jolly pair will be stationed at the Chamber of Commerce office. A holiday door hanger workshop will be held at Mornin’ Glory Coffee Shop from 1 to 3 p.m. Participants are asked to register online for the workshop, which is limited to the first 40 people. Search Facebook for “Webster City Painting Event at Morning Glory Coffee.” The cost for the workshop is $35. From 3 to 5 p.m., children can do some free holiday crafts with Legacy Learning at the former Big Picture store, 600 Second St.
Webster City Community Theatre will present “A Christmas Carol – Abridged” at 4:30 p.m. on the Availa Bank Plaza stage. The performance will be followed by Christmas music selections presented by the Webster City High School band and choir. Capping off the afternoon will be the tree lighting ceremony in Availa Bank Plaza. Dr. Mandy Ross, superintendent of schools, will do the honors of flipping the switch to light the community tree at 5:30 p.m.